At first, Timmy Joe Elzinga thought he was seeing the northern lights. After all, the aurora borealis are a not-uncommon sight in North Bay, Ont., where Elzinga lives. But unlike the northern lights, which shimmer and coil across the night sky, these beams of light were mostly stationary, close to the ground, and appeared localized to Elzinga's neighbourhood. 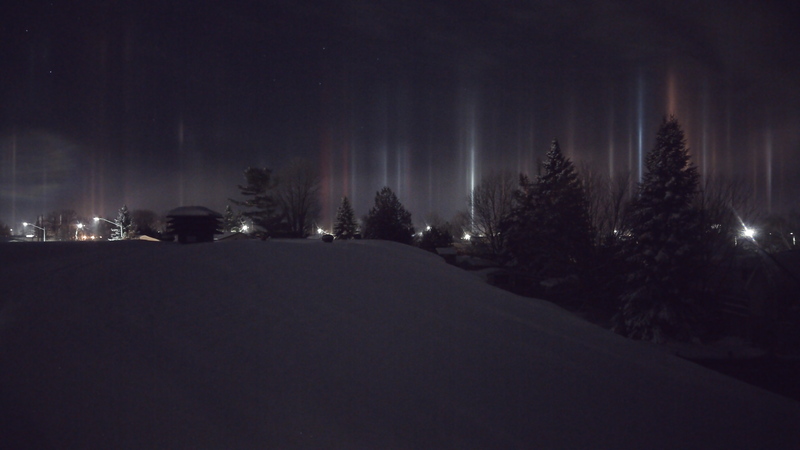 After shooting a couple of photos and a brief video of the phenomenon, Elzinga did some Internet research and learned the name for the sci-fi-esque phenomenon: light pillars. Light pillars occur on very cold nights when plate-shaped ice crystals suspended in the air close to the ground reflect light from artificial sources, such as street and traffic lights. As air currents disturb the angle of the ice crystals, they can end up projecting the light into elongated columns; the larger the crystals, the more pronounced the effect. Light pillars are akin to other wintertime optical phenomena such as halos, arcs and 'sun dogs,' which are also the result of light reflecting and bending through differently-oriented atmospheric ice crystals. Elzinga's photos quickly went viral after he posted them on Imgur earlier this week, with people comparing the illusion to a special effect from Star Trek or X-Files and even expressing disappointment that they could be explained by science. "One woman commented she wished it was supernatural and unexplainable!" Elzinga says. Sadly, for the X-Files fans among us, the truth is not so out there.